Made in the indigenous way of Khadi, Seven Senses is an interpretation of the historic and traditional heritage of India – of hand-spinning and hand-weaving. Because of this, every Seven Senses fabric has its own personal journey which leaves an individual trace of craftsmanship, making them unique and exclusive. 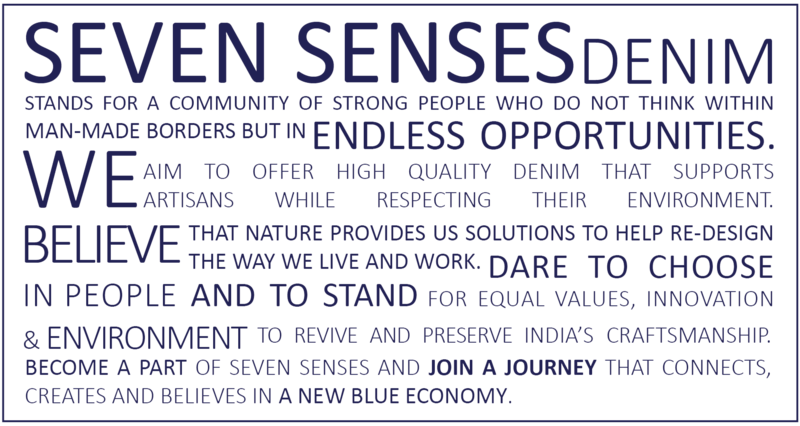 Seven Senses is one of the few companies that still produces fabrics using extensive hand work while keeping the age-old crafts alive in a socially and environmentally friendly way. We were able to turn the Seven Senses philosophy into a reality as a result of our partnership with KDB Samiti- Kattin Dhuniya Bunkar Samiti, an official Indian non-governmental organization working in Bihar. Thanks to this collaboration, we are reviving, preserving and sharing India’s craft traditions with the world. As a result, we are trying to contribute to the development of rural areas in India by bringing work to the local residents, investing in their education and helping them improve their standards of living.